Intel Atom processor has been penetrating well in both netbook and embedded market and if you wonder what other market segment that it can fit into, SeaMicro has an answer for you. Just recently, the company has announced a new server design utilizing multiple Atom processors integrated into one single server platform for advanced power computing needed by server applications. Being designed with Intel Atom Z530 processors, the whole server system, with the named of SM10000 can integrate as much as 512 Atom CPUs with 16 Atom processors and chipsets on a single PCB, with up to 32 PCBs stacked together to build a powerful server with easy scalability. The advantages are obvious, by getting away from the netburst microarchitecture in favor of much more low power core design, the whole system will be able to stay in better thermally efficient by shutting off unnecessary core for power saving depending on work load and CPU utilization, thanks to its DCAT (Dynamic Compute Allocation Technology), a software based algorithm with ability to manage and monitor the existing activities. Besides, system integrators will be able to scale better with combination of different number of Atom CPUs (up to 512 discrete CPU) depending on actual needs, versus fixed number of much more powerful cores that may underutilized while draining excessive current unnecessarily. That is not all, the design is claimed to have remove almost 90 percent of its discrete components needed for conventional server system with additional power and BOM (Bill of Material) savings as a whole. However, since Intel Atom processor doesn’t support ECC on memory design, so it may have drawback of not able to support mission critical applications. Nevertheless, with approximately 75 percent in both space and power savings as compared to conventional mainstream servers, it is no doubt a great and novel way of server design based on Atom processors. 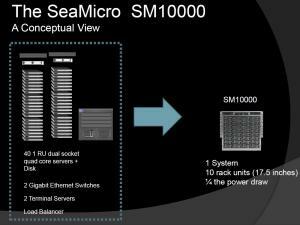 Priced at $139,000, the SM10000 will start sampling by beginning of July and commercialized by end of July 2010.